The Kryziu Kalnas (“The Hill of Crosses”) in northern Lithuania might be the world’s most spontaneous unusual man-made attraction. No one owns it. No one runs it. No one even knows how it came to be. 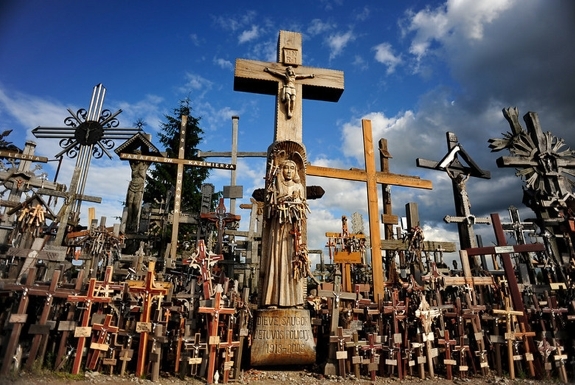 What is known is this: For as long as anyone can remember, there’s been a 10-meter high mount of earth near the town of Šiauliai that’s been covered in crosses. A 1990 count put the number at 55,000. In 2006, an estimated 100,000 crosses stood on the hill. At the time of writing, there could easily be over 150,000. For a long time, crosses were carried to the hill exclusively by pilgrims. Written reports of the devout traveling to the Kryziu Kalnas from throughout Eurasia date to around the time of the founding of Šiauliai in the year 1236. Oral accounts of pilgrimages to the Hill of Crosses go back at least a century before that. Why the crosses were placed on this particular hill is a mystery. One leading theory contends that the Hill of Crosses sits on the site of an ancient cathedral, though Spot Cool Stuff could not unearth any archeological evidence supporting this that’s been made public. Also shrouded in uncertainty is how the Hill of Crosses survived Communist rule. Lithuania was rather involuntarily incorporated into Soviet Union after World War II. Its authoritarian overseers, being staunchly atheist, didn’t take kindly to Hill of Crosses. The Red Army repeatedly bulldozed the site. On three occasions (in 1961, 1973 and 1975) all the crosses on the hill were destroyed and the entire area was covered with sewage. The KGB even declared the hill a no-go zone and blocked all roads leading to it. Not matter what they tried, the crosses on the hill kept reappearing. 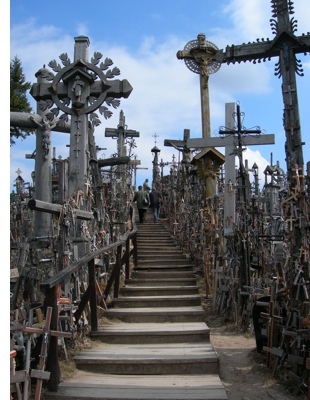 After Lithuania gained independence in 1990 the Hill of Crosses became a symbol of national resilience. Three years later, it gained international fame when the site was visited and blessed by Pope John Paul II. Today, the Hill of Crosses is a popular destination for tourists, both religious and secular, who arrive by the bus load. The hill is also a popular place for weddings. Local churches and artisans often create elaborate crosses to leave on the hill. Though any cross, no matter how modest, is welcome. If you visit, feel free to bring your own to all to this mysterious, and ever growing, attraction. Learn more in the 14-minute video documentary on the Hill of Crosses, below.